A really long time ago I enjoyed reading Jojo’s account of her cheese and wine party and tucked the idea away to try sometime. Then a few weeks ago on a trip to Lisbon, we were sitting outside enjoying a glass of wine and the people on the next table ordered a cheese platter to share. I was determined to make it happen and finally I did (if you can call 2 people a party). I served a mixture of home made and bought vegan cheeses, bread, crackers and a few vegetables for dipping – for show mostly. 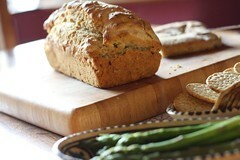 The bread shown above is the garlic and dill bread from Vegan Diner. I jumped for joy when I saw this recipe didn’t contain my nemesis, yeast and it worked very well indeed. The crackers were all store bought. For the bought cheeses, I tried two for the first time. The Sojami basil soft cheese was spreadable, creamy and reminiscent of Boursin. The Vegusto was an absolute revelation. Matthew said it reminded him of cheddar and that if we could buy it locally he would eat it instead of dairy cheese. (He does enjoy Cheezly and home made vegan cheeses and sauces if I’m cooking but generally keeps cheddar in for if he’s fending for himself). Not part of the cheese and wine evening but I used the rest cooked in a pasta dish where it was equally good. I loved it and would choose it over any other non dairy cheese I’ve tried including Daiya. (Vegusto at the front, Sojami behind it). 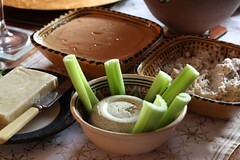 Semi homemade was the delightful blue cheese dip made with the new Redwood blue cheese. Rich and creamy and worked well both on crackers and crammed into the celery sticks in an attempt to persuade myself I was eating vegetables. 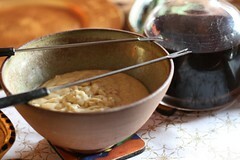 The first completely home made cheese at the party was the fondue from Vegan Substitutions. I’d made this during testing and enjoyed it and it was nice to have a hot cheese to dip cubes of bread into. I think I liked it even better though the following day using the tip included with the recipe – spread onto bread with tomato and truffle oil and heated. The final cheese was the smoky mountain cheese from Vegan Diner. I’d seen a bit of buzz around this on the internet so was keen to try it. For something containing agar it was astonishingly easy. There was a touch too much smoked paprika in it for me; I found it a bit overpowering, but the texture was excellent and I’d definitely make it again. The grilled cheese sandwich recipe from the same book which used the leftovers were superb. Smoky mountain cheese, top left. The cheese and wine night was great fun. It was nice to do something I thought I’d never do again when I went vegan and I’m looking forward to doing it again. The leftovers kept us going for a good few days, used in a variety of ways. Are there any cheeses I must try next time? This entry was posted in Vegan Diner, Vegan Substitutions by efcliz. Bookmark the permalink. Yum! That all looks delicious! wow, how fun. I never even liked cheese when an omni strangely enough but I’m loving homemade vegan cheeses- still haven’t tried any bought ones, even cheezly yet! I’m going to have to post mine on Monday! Looks wonderful, Liz! Perfect! I really need to have another cheese & wine night soon. 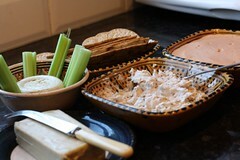 You also reminded me I need to make Kip’s blue sheese dip again, it’s so good! This all sounds amazing! I used to eat so much cheese, luckily I don’t really miss it because I haven’t found any alternatives I like. Probably because I tried one from ‘The Uncheese Cookbook’ which promptly went in the bin and I haven’t been brave enough to try any since! Where did you get the Vegusto from?? Did you order it from the linked website? I’d love to try it.